Keep your low-voltage landscape lights shining bright and well maintained all winter long with these five tips from our service department. Minerals deposits, dirt, and debris can dim or completely block the light from a fixture. Keeping your lenses clean is important if you want the best lighting effect. Particularly, low setting ground fixtures. You can use a nonabrasive cloth and CLR type of cleaner to clean your lenses. It might take a bit of elbow grease to get it clean. After a big snow storm, you may want to clear some of the snow from your fixtures. Halogen bulbs emit enough heat that may melt away most of the snow. 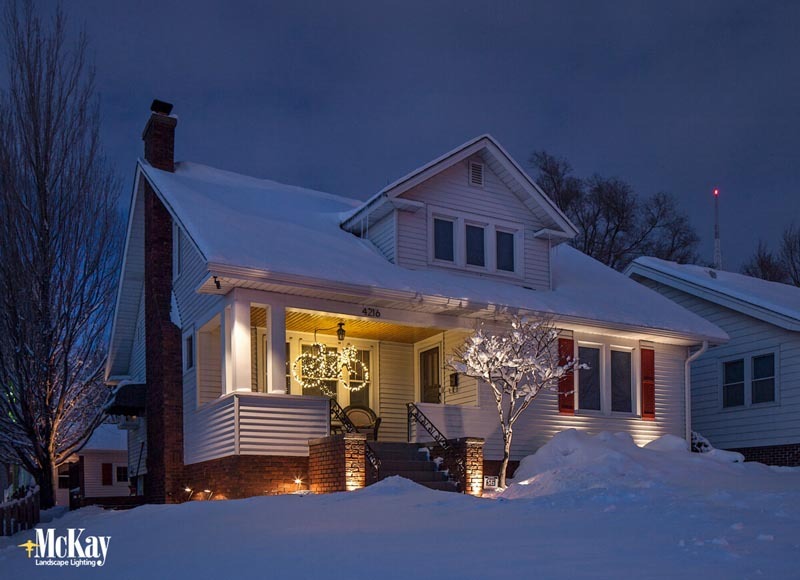 LED bulbs produce less heat (this is why they are more energy efficient) and melt less snow. When the ground freezes and thaws, it can sometimes force wire(s) to work its way up to the surface. Exposed wires need to be inspected and reburied before the ground freezes. Exposed copper or damaged wire indicate repairs need to be made. We do not recommend doing this yourself. Check with the company that installed your system to see if they have a dedicated landscape lighting service department that can make the necessary repairs for you. Over time, fixtures can move out of alignment or get damaged from landscaping, snow removal, or the wind (mostly downlights in trees). You can periodically walk through your property to re-align any crooked fixtures. Take extra care when removing snow near fixtures. If a company removes your snow, let them know you have fixtures near where they plow (the drive and walkways are most common). You could purchase flags or poles from a local hardware store to indicate their location. The best way to maintain your landscape lighting system is to prevent accidental damages. Extreme temperatures can shorten the life of a bulb. We recommend you replace any bulbs that are out as soon as you can. Each bulb in a low-voltage system draws a small amount of voltage. As bulbs burn out, the good bulbs nearby receive more voltage, which can shorten their life. Landscape lighting systems tend to run longer every night since there is less daylight in the winter months. We recommend utilizing an Annual Service Program. Look for one that includes having a service technician visit your property once a year to replace all of your halogen bulbs or check for faulty LED bulbs, clean lenses, reposition fixtures, complete a thorough performance check, and make any necessary adjustments or repairs. Bonus, if they warranty their bulbs (we do!). Then, if a bulb burns out within the year, you just let them know since the bulb cost is covered by the warranty. Ice and snow can cause system outlet issues. More specifically, the melting can trip your GFCI outlet. If this happens, push the "reset" button on the outlet and make sure the cover gets closed. Please use caution when working with electricity and don't ever stick anything into the sockets. Sometimes an outlet may simply need reset and closed properly. If the cover is damaged, you'll want to get it replaced. If the outlet looks damaged or will not reset, you may need to contact a licensed electrician. Remember, anytime there is power loss, you'll need to reset the landscape lighting timer inside the transformer. Feel free to contact us if you have any questions or concerns about resetting timers or outlets. With all things electrical, please remember to use caution. Do not attempt to make any repairs if you are not familiar with the electrical systems. Safety is the number one priority. A properly maintained outdoor lighting system makes your home safer, enhances its beauty at night, and aids in preventing potential intruders or vandals. Properly lit walkways can help avoid dangerous slips and falls due to ice and snow. Besides the winter, several of these tips can be completed at any time throughout the year. Please contact a professional with any major lighting or electrical issues. Once again, we highly recommend an Annual Service Program. Our customers enjoy the peace of mind of knowing their family is safer because we check their lighting system every year and make sure it's performing its best. We’ve been in the landscape industry since 1987, becoming a dedicated outdoor lighting firm in 1992. Our experienced lighting team provides the expertise and experience needed to light your outdoor space for both beauty and security. Our goal is to provide the highest quality, custom lighting services and products, to homes and businesses across the nation.